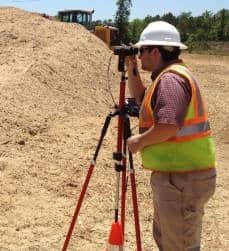 Measuring stockpile volume using LandMark Spatial Solutions Stockpile Inventory Solutions is by far the quickest, safest and one of the most cost effective methods available. The LMSS Solution employs reflectorless laser technology in the form of a TruPulse 360R electronic rangefinder and compass manufactured by LaserTech International (LTI). 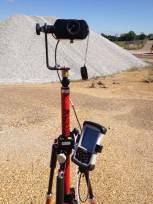 Whether it's aggregate, coal, wood chips, asphalt or anything else you inventory, this system has the ability to accurately measure almost any surface without the need of a reflector and the additional crew member required to hold it. 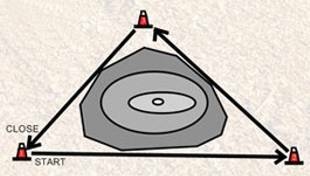 Traditional stockpile inventory methods require your crew to hold a prism pole and occupy areas over the surface of a pile. This process can be time-consuming and sometimes dangerous and requires a two person crew. Loose material, irregular shaped piles and steep slopes can make the use a total station and prism pole difficult if not impossible. GPS systems in use also require that individuals occupy positions over the surface of pile. Depending upon the type of GPS receiver/antenna used, results can be less than desirable. Satellite signal and/or availability can be an issue in certain environments. Aerial fly-over inventories are expensive and the turnaround time for results can be days or weeks. With the LMS Inventory Solution, volumes and tonnages can be calculated in the field instantly and download from the data collector in a variety of formats. Aerial fly-over inventories can be limited by severe weather and cloud cover which will not affect the LMS Inventory Solution. The Landmark Spatial Solutions Stockpile Inventory Solution utilizes the TruPulse 360B Laser manufactured by Lasertech International (LTI). LTI has also developed a simple, easy to use program for creating maps of the stockpiles and calculating volumes and tonnage. The MapSmart Software resides on a Trimble Recon that is Bluetooth enabled and integrates seamlessly with the TruPulse 360B. This turnkey system includes tripod, mounting brackets and everything you need to start taking inventories today. Training can be done on site or via the web and people are generally operational after a 4-6 hour session. Written materials and video tutorials are also available. Landmark Spatial Solutions also maintains a full service technical support and repair department and offers a variety of support options. The developers of MapSmart understand the need for a software application to be easy to use and deliver good results. File/map creation are done in real time as each laser shot is taken. Quality control of data in the field is a snap because you can see them map of the pile begin to take shape as you measure. Bad data points will be visible and can be easily edited out and/or retaken. Volume calculations can be done in the field and stored in a variety of formats both tabular and graphic for download later. Below are screen captures of different MapSmart windows. Walk around the pile, temporarily marking the instrument points that will afford full views of the surface. Choose a starting point, set up and configure TruPulse laser with the MapSmart software. Aim and shoot all necessary points on the pile from the starting location. After collecting your last data point, aim and shoot to the next instrument location and then occupy that point. Continue shooting the pile from each new location until the entire surface has been measured. Either transfer your field data to your PC for processing or perform volume calculation right in the field following a few steps found in MapSmart + Volume software. 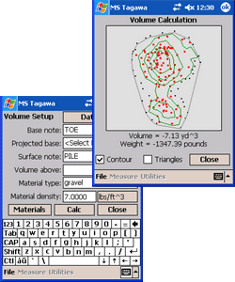 MapSmart Volume Setup and Volume Calculation windows showing a bitmap of the pile, weight and volume. More and more companies are conducting inventories on a monthly basis and using this information to better schedule their production and manage their operations. Larger companies that are subject to the Sarbanes Oxley Act are hiring third parties to verify their stockpile inventories to stay in compliance with the law. Landmark Spatial Solutions integrates all components necessary to create this Stockpile Inventory Solution for purchase to be used internally by the customer, or we offer stockpile inventory verification services to those that are so inclined. Please contact a Landmark Spatial Solutions Representative today for a free no-obligation demonstration. You won’t be sorry!